This rather unremarkable obelisk on Putney Heath actually commemorates the invention of ‘Fireproof House’ and was erected, not coincidentally, on the 110th anniversary of the great conflagration. The rather eccentric David Hartley, an inventor and MP, came up with the idea of sheathing joists under floorboards with thin layers of what were initially iron and later iron and copper plating to prevent the spread of fire in homes and ships and was granted a patent for his system in 1773. Known as ‘Hartley’s Fire Plates’, he claimed in a pamphlet that a single fireplate might have prevented the Great Fire – a claim which got other MPs excited and led them to grant him cash – £2,500 – to continue his experiments as well as an extension on his patent, from the usual 15 to 31 years. His experiments included building homes for the express purpose of setting them alight to test his invention, one of which he built on Wimbledon Common. Known as the ‘Fireproof House’, the property was repeatedly set alight in front of prominent witnesses. These included MPs, the Lord Mayor of London and Aldermen of the City of London – who granted Hartley the Freedom of the City and encouraged fire plates to be included in all new buildings in London – and, of course, King George III and his wife Queen Charlotte. One of the tests was apparently carried out while the royal family was eating breakfast in an upstairs room inside (they survived unscathed – one hates to think of Hartley’s fate should they not have). 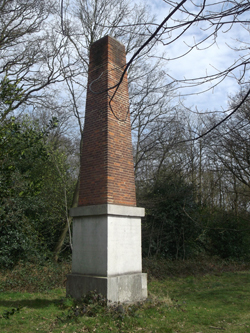 The house is now gone but the Hartley Memorial Obelisk, erected just off Wildcroft Road in what were formerly the grounds of Wildcroft Manor, remains. The red brick and stone Grade II-listed structure was erected by the City of London Corporation in 1776, the 110th anniversary of the Great Fire of London, to commemorate Hartley’s invention of fire plates. The first stone in the monument – which is attributed to George Dance – was laid by the then Lord Mayor, John Sawbridge.